You may be unaware that certain symptoms that you frequently experience are related to TMJ. Frequent morning headaches, soreness in your neck, stiffness when you chew, and clicking in your jaw are all common complaints among those with Temporomandibular Joint Syndrome (TMJ). The temporomandibular joint is the hinge joint that connects your jaw to your skull, allowing it to open and close. When this joint is injured or damaged it can lead to localized pain and residual discomfort called TMJ syndrome. From this list, it is easy to understand why TMJ is often overlooked. Many people do not tend to talk to their dentists about ear pain or frequent headaches because these are not typically associated with the teeth. However, the relation of the temporomandibular joint to the rest of the skull presents good evidence for TMJ syndrome when it is accurately understood. Many people find that by talking to their dentists they can utilize effective at-home remedies to alleviate their pain and discomfort. Gentle stretches of the jaw and neck muscles, ice packs, refraining from chewing gum, and OTC nonsteroidal anti-inflammatory drugs, along with reducing stress can be effective for many people. 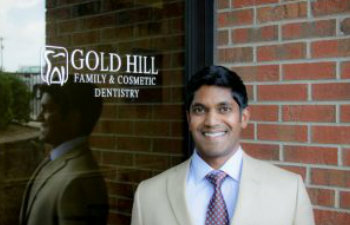 At Gold Hill Dentistry, we offer a wide range of dental services. If you are concerned that symptoms you have been experiencing are a result of TMJ syndrome, contact our practice today to schedule an appointment for accurate diagnosis and effective treatment.